You might have noticed the badge at the top of my right hand column -----> Yeah, the Stamping Around Ohio one? Not sure if I've mentioned this before, but I'm teaching one of the classes! Yep, little ol' me! If you're in the area we'd love to have you join us. There are going to be some amazing stampers there teaching and so much fun making new friends and seeing old ones again. So, check it out and come join us! Today is Memorial Day in the US, so I'd like to take this opportunity to pay tribute to all of the Americans who care so deeply for our nation that they were willing to sacrifice themselves to defend it. So this card and my heartfelt thanks is for all members of our armed forces, those who lost their lives in service to their country and our brave veterans. They are all my heroes. I'm using MFT's Well Worn Greetings Die-namics Dies and Stamp Set apparently out of stock), with this perfect sentiment, for my card. 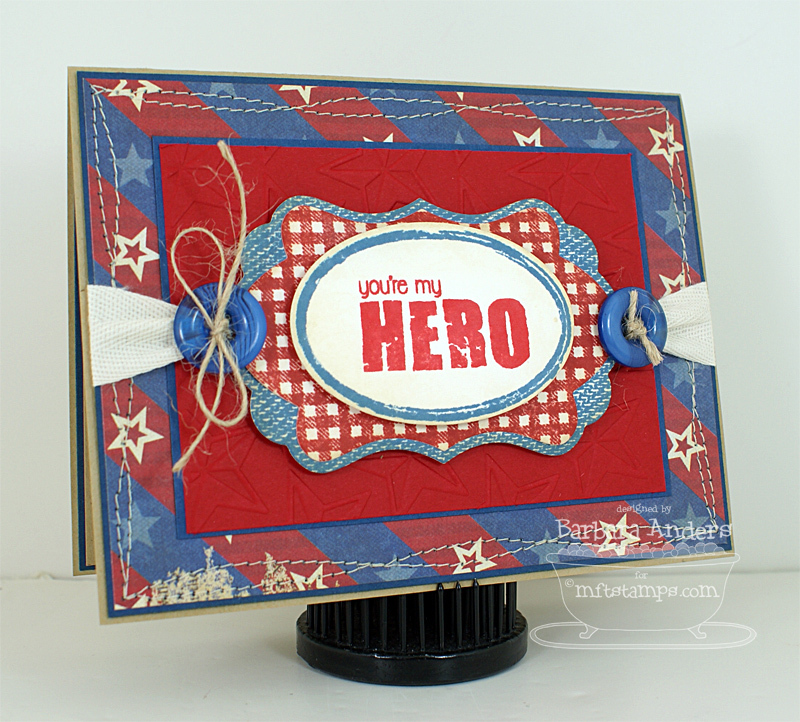 I love that denim background stamp and the gorgeous gingham one, don't you? I wanted to make this card with an Americana feel and I think it worked. My patterned paper is from K & Co. Americana Mat Stack and I ran the Wild Cherry card stock though my Stars embossing folder. 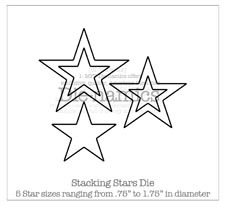 Here's the inside, with another sentiment from the set and some stars cut with the Stacking Stars Die-namics dies. Thanks so much for stopping by today. I hope you'll find time to thank a soldier or veteran today. Woohoo!! It’s Saturday and you know what that means! Yeah, it’s the weekend, but it also means it’s Crazy 4 Challenges day! This week’s challenge is again brought to us by Joanne and it's another fun one! Since schools are getting out and weather is warming up, folks are beginning to think of vacations. So, our challenge this week is to make a card or project that reflects a favorite vacation spot or activity. My DH and I love to take road trips so I chose this little PI called Are We There Yet? She's got her bags packed and is rarin' to go, don't you think? My patterned paper is Basic Grey's Wander, also appropriate, I'm thinking. This is becoming one of my go to papers for anything travel related, LOL! I'm going to have to buy another pad soon at this rate! So, I stamped this little sweetie on an MFT Perfect Paper Panel (out of stock) with Memento Tuxedo Black ink and colored her with Copic markers. My layout is simple and I added a little seam binding ribbon and a button, along with a tag made with my Die-namics Notched Tag die tied on with a little twine. Another sentiment and image from the set is on the inside of the card. THEN, you know what to do--we'd love to have you come along and play with us. Just do your thing with the challenge and link it to Mr. Linky on the Crazy 4 Challenges blog. Please link directly to your project. And, if you upload to a public gallery, please use the key word C4C889. Welcome back to another Flourishes Friday--today we're focusing on Flourishes' Copic collections. 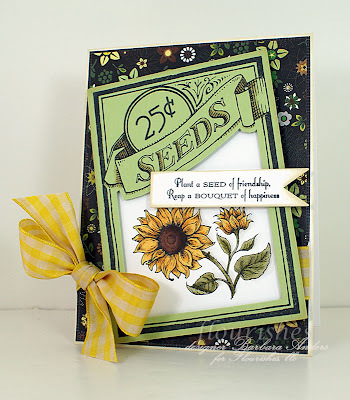 For my card, I chose to work with Seeds Of Friendship and Sunflowers. First, I stamped the seed packet image on light green card stock with Memento Tuxedo Black ink, then I cut it out and cut out the large blank section inside. Then I stamped the SEEDS image and the 25¢ image. I wanted the center section cut out to serve as a frame for my sunflower image. It was stamped on Classic White card stock with Memento Tuxedo Black ink and colored it with Copic markers. For the sunflower center I used the Flesh Tones #2 Collection. For the flower petals I used the Sunflower Collection and for the leaves I used the Evergreen Collection. After I had my sunflower colored, I trimmed it to fit the seed packet and popped the seed packet up on foam strips to give it some dimension. Then I stamped the sentiment and cut it out with my Grand Calibur and a Spellbinder's Nested Lacey Pennant die. Finally I tied a hand tea dyed yellow gingham bow around. My patterned paper is from Basic Grey's Origins collection. It’s Wednesday so that means it’s time for another Color Throwdown challenge AND an MFT Wednesday Sketch Challenge! This week’s colors were chosen by sweet Laura and she’s given us a lot to work with. And here’s this week’s sketch. You can find the sketch on the MFT blog and also in the MFT forum on SCS, as well as in the weekly newsletter. The Design Team will be on hand to provide plenty of inspiration to get you started. And, here’s my card. Laura’s colors were inspired by Echo Park’s Springtime collection so I used several patterns from it for my card. Make’s it easy, right? Not a lot of ‘splainin’ needed, I think. I used the smaller die from Decorative Doily Duo for the rounded elements, the Faux Crochet Border, and the Sweet Stack Labels Die-namics dies for my focal point and sentiment. The sentiment is from Sassy & Sweet as is the one on the inside of the card. Some wide twill and some Caribbean Teal baker’s twine provide the center element and that’s that! The inside, with the other sentiment and another Faux Crochet Border. Remember, you do not have to have the exact colors to play the Color Throwdown challenge. If you don't, just use the closest you have. So, c'mon over to the Color Throwdown blog and play along with us this week. Please use the link service to post your card and please link directly to your card so we can find it easily. And please include a link in your post to the Color Throwdown. If you upload your card to a public forum, please use the keyword CTD143 so we can see your beauty all in one place. Hope to see you there! Be sure to check out what the other team members have come up with this week! Today I have a sweet little baby card using May's Taylored Expressions Key Ingredients kit. As soon as I saw this little birdie paper I thought "BABY"!!! This card is super simple and CAS :) No stamping involved and everything came in the kit except the Copic marker I used to color the fabulous Thickers and the border punch for the lacy border. You just can't beat that! This card also works for the Shabby Tea Room challenge for this week: Sweet Baby. If you're not familiar with the Key Ingredients kits, be sure to check them out HERE. Hi there!! First off, I want to thank everyone for all of the fabulous birthday wishes from yesterday! My bestie, Tammy, organized a surprise blog hop for me - I was blown away by all the gorgeous cards my amazing stamping friends made for me. And the comments on my blog were equally amazing. Thank you all for making my day very, very special!! So, since it’s Saturday, it’s Crazy 4 Challenges time! 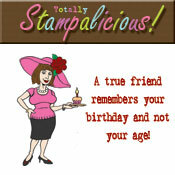 Today’s sponsor is our very own Joycelyn’s Totally Stampalicious! Be sure to check out the Crazy 4 Challenges blog for all the details of how you can win a prize from Totally Stampalicious! THEN, you know what to do--we'd love to have you come along and play with us. Just do your thing with the challenge and link it to Mr. Linky on the Crazy 4 Challenges blog. Please link directly to your project. And, if you upload to a public gallery, please use the key word C4C88. Today is Flourishes Friday Free For All and I've got another card using the Country Charm Borders and Country Charm Labels sets along with the coordinating Grommet Tags from Spellbinders. I went black and white with a splash of color for this card. First, I stamped a couple of the borders on Classic White card stock with Versafine Onyx Black ink. Then I stamped the matching Country Charm Label and cut it out with the coordinating Grommet Tag die. Next I stamped the sweet sentiment in black ink and one of the little flowers with Memento Rose Bud ink. I added a hot pink layer and a black layer, then tied it all on with some Hot Pink Cotton Linen ribbon, and finished it off with some black flat back pearls. Don't forget that today is the last day that you can get the new release bundle, giving you 10% off. Get all the details HERE! Thanks so much for stopping by! Be sure to check out what the rest of the Flourishes team has for you today! Hi there! I’m back again today with some cards using one of the retiring Flourishes sets: Menswear. What a FABULOUS set for Father’s Day cards! I had so much fun I made three cards! First up, I made one using the traditional Father’s Day gift, the neck tie! I stamped the tie image three times on patterned paper (Basic Grey’s Boxer is PERFECT for this! ), cut them out and popped them up on foam. 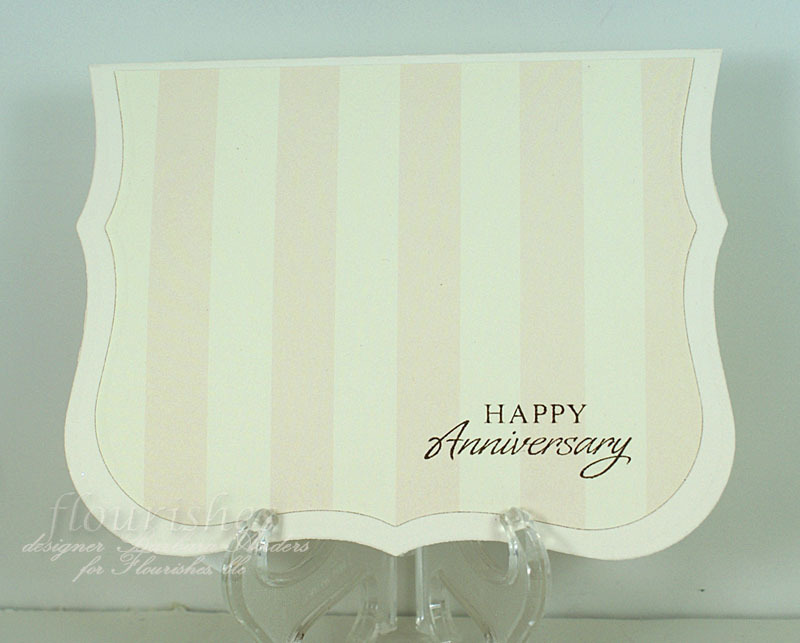 The sentiment was stamped on Classic Ivory card stock and cut out with flags from my Spellbinders’s Nested Lacey Pennant set and my Grand Calibur. Some baker’s twine and some brads was all it needed to finish it off. My second card is a little different—a little less “formal” :) I started by making the award ribbon. I cut strips of paper, fan folded, and made a medallion. Then I stamped the “#1 Dad” sentiment and cut it out with my Standard Circle and Petite Scalloped Circle Nestabilities and attached them. Finally, I added the ribbons and I had my award! Happy Father’s Day was stamped on patterned paper, wrapped with twine, and layered on some ribbon tabs. Patterned paper is from Cosmo Cricket’s The Boyfriend. My last card is different from the first two. This one uses the shirt image and I decided to make it look like a comfy chambray shirt. I stamped the image on patterned paper and cut it out. The only other thing I did was to add just a little shading with a Copic marker. then I layered up some patterned paper to match, stamped the sentiment, tied on some twill, twine, and a button, and added a couple of brad in the corner for balance. And, there you have it! I love how they all turned out and neither one took a ton of time! Thanks so much for stopping by! I’ll be back on Friday with a Flourishes Friday card! Wednesdays are such fun around here—combining the MFT sketch and the Color Throwdown colors makes card making easy—usually! This week my girl Broni has chosen the colors and they were a REAL challenge to me! And here's the sketch--another fun one from MFT! Which I flipped, of course, LOL. You can find the sketch on the MFT blog and also in the MFT forum on SCS, as well as in the weekly newsletter. The Design Team will be on hand to provide plenty of inspiration to get you started. And here’s my card. I’m using MFT’s new Just My Type Die and Stamp Set (yes, again, because I love it!). I decided to keep it relatively simple and use a lot of white space to balance these strong colors. I used the Open Zig Zag Border Die-namics die for a white border, topped it with some black lace and, although you can’t really see it here, there’s a green panel under the typewriter, following the sketch. Some Kiwi Kiss ribbon, a Basic Gray flower, made with the Pretty Posies Die-namics die, and it was pretty much done. I also added some lime Dew Drops to bring attention to the Zig Zag border. And here’s the inside, with another sentiment from the set, another Zig Zag border and another flower. Remember, you do not have to have the exact colors to play the Color Throwdown challenge. If you don't, just use the closest you have. So, c'mon over to the Color Throwdown blog and play along with us this week. Please use the link service to post your card and please link directly to your card so we can find it easily. And please include a link in your post to the Color Throwdown. If you upload your card to a public forum, please use the keyword CTD142 so we can see your beauty all in one place. Hope to see you there! Be sure to check out what the other team members have come up with this week! Welcome to my stop on MFT’s May VIP Blog Hop!! This month’s VIP Package is in the store! And the VIP Hop and Shop has begun! If you just happened upon the hop, you really should scoot on over to the MFT blog 'cause that's where the hop starts. Wouldn't want you to miss a bit of inspiration, KWIM? If you're not familiar with the VIP kit, it's a LIMITED QUANTITY product that gives customers the opportunity to purchase the WTG set TWO WEEKS early. How cool is that!? And here’s my card. I stamped WTG on a Perfect Paper Panel (out of stock) with Memento Tuxedo Black ink, colored her with Copic markers and cut her out. I wanted to pop her up on this adorable patterned paper. The sentiment is from the set, attached to a buttoned up bow. There rest of the design is pretty obvious, I’m thinking. I did use the Open Zig Zag Border Die-namics die for some visual contrast. For the inside, more zig zags, patterned paper, and a sentiment from the mini set included in the VIP package. Thanks SO much for stopping by! Now you need to head on over to the fabulous Melody’s blog to see what amazing project she has for you. I’m SURE you’ll be glad you did! What did you think of our little lady yesterday? Too, too cute, right? And did you see the news? In the past, we've released our à la modes images in cling rubber, however, this month, we're releasing both of our à la modes in clear photopolymer, just like the rest of our stamps. This means that we can bring them to you a slightly lower price point than usual - $9.00 each! How fabulous is that?! Since our clear stamps are made in the USA, they are of the highest quality, so you'll have the same great image quality that you're accustomed to with any of our other clear stamps! Sweet deal right? I stamped her on a Perfect Paper Panel (out of stock) with Memento Rich Cocoa ink and colored her with Copic markers before cutting her out. I used MFTWSC #2 for my layout. I decided to distress some of the elements to add that “aged” look and used some sailor’s knots for the long vertical element. I scrunched up the sentiment flag but you really can’t see all the wrinkles in this picture. A Dizzy Doily Die-namics die cut frames the map element. Here’s the inside with another sentiment from the set and a Dizzy Border Die-namics die cut. Thanks so much for stopping by! Hope to see you back tonight for the VIP Hop and Shop! Both of the new à la modes plus the VIP Package will be available at 10 PM EDT tonight! With Gratitude - Flourishes 1, 2, 3 Create Kit!